Many! The Sun, the Earth, orbital factors, greenhouse effects, ‘natural’ gasses, man-made pollution, cosmic rays, now add dust (see para 2). I am now trying to get some order into this theme. Already noted as a Work in Progress, there is much to be done. Pity really, I had hoped that by now the world would have woken up to the real picture, and my contribution would be unnecessary. But no, the politicians are still hell-bent on destroying our social structures to suit their ambitions, based on lies! Seems to be the way of the ungodly in several areas. (Added 21 Sept 11). 1. The SUN. Solar energy! The actual source of the heating, modified by factors following below. Even though Earth’s modifying mechanisms are several and strong, the heating and other forces from the Sun are FUNDAMENTAL! A change in these will have some effect on Earth’s near surface temperature control system. What is affected and by how much is looked at very carefully here. There can be no doubt that surface-heating effects of a more radiant sun will, not be exactly counter-balanced by our natural control mediums because the counter balancing must be initiated by an actual change in earth surface heating. A new equilibrium will be reached, (hopefully), but not without a surface heat change of some amount, in some place. Certainly, what might have otherwise been a, say 10 degC increase at the surface, might be balanced by a surface temperature increase of, say 1 degC because the feedback control mechanism of the atmosphere. But there must be some change at the surface. The only way that this can be not true, is if the temperature control system that is our atmosphere is modified by an influence outside of our ‘little’ closed system. This is part of the study here, introducing ‘Cosmic Rays‘ as a factor. Strangely enough, even though cosmic rays are derived externally to our Solar system, it appears possible that their influence on our ‘control system’ is modified/moderated by the Sun anyway. A beautiful scenario. These are given their own pages as a subset of ‘The Sun”. Ref: http://wattsupwiththat.com/reference-pages/solar/ This site provides extensive, comprehensive, detailed information for the technically minded. Some of it is copied into theses pages in the appropriate places. 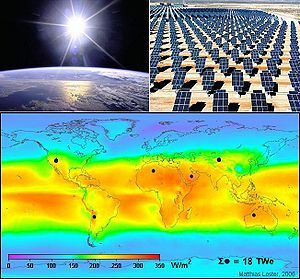 (Image via Wikipedia) For the sake of the current dilemma, this is just an interesting reference, but it is nice to know that the scientists consider that the long-term prospects for our Sun to keep us alive are quite healthy. Even if they are a bit inaccurate, (who would know? ), civilizations are unlikely to survive for many other reasons. So for the next billion years, we expect the Sun to have roughly the same sort of output. In the short term, however, its specific output does vary, enough to influence our well-being and must be taken into account in this assessment of Earth’s climate. One thing for sure – this factor is not in any way, influenced by human endeavours. (Unless maybe there is a God prepared and able to respond to our prayers. Don’t laugh, no man KNOWS for sure what spiritual powers there are and to what extent we might connect with them). (Updated 21 Sept 11). What’s Going On With the Sun? 2. Absorption and reflection characteristics of earth surface. Heat storage and loss factors. 3. Absorption and reflection characteristics of the atmosphere/ionosphere. Which depends on its composition, including CO2. Effects of volcanic emissions. Man-made pollution. “Greenhouse effects”. Cosmic Rays (see #9). Great comment, cleanwater. But omigosh, paragraphs! I had to paste it to Word and re-format to read it! Even so, as I say, top comment. 4. Blocking by clouds. ? both ways? 5. Cosmic Rays. Modified by the solar magnetic field and pertubations, in turn directly? affecting cloud formation. (More cosmic rays, more clouds; more magnetic field strength, less cosmic rays reach earth. http://www.youtube.com/watch?v=ANMTPF1blpQ Svensen hypothesis, hated by IPCC et al! 6. Distance and orientation of earth to sun. on CBC’s The National Earth axis orientation. 7. Heat sources on earth – fires; internal heat dissipation; volcanoes; creation of electrical energy – coal, nuclear, gas; transport fuel burning; even our bodies converting food to heat. Geologists have used temperature measurements from more than 20,000 boreholes around the world to estimate that some 44 terawatts (44 trillion watts) of heat continually flow from Earth’s interior into space. Have seen aphoto of a ring of vlcanoes spewing heat right around the Antarctic ?continent. Cannot find where I stored it, if i did. August 1, 2011 at 5:15 pm from wuwt http://wattsupwiththat.com/2011/08/01/rise-of-the-1st-law-deniers/ on time lags. Complete post: Rise of the 1st Law Deniers Considered very relevant!! COMMENTS ABOUT GLOBAL WARMINGBy John Coleman (the founder of the Weather Channel)It is the tagreest scam in history. I am amazed, appalled and highly offended by it. Global Warming; It is a SCAM.Some dastardly scientists with environmental and political motives manipulated long term scientific data back in the late 1990 s to create an allusion of rapid global warming. Other scientists of the same environmental wacko type jumped into the circle to support and broaden the “research” to further enhance the totally slanted, bogus global warming claims. Their friends in government steered huge research grants their way to keep the movement going. Soon they claimed to be a consensus.Environmental extremist, notable politicians among them then teamed up with movie, media and other liberal, environmentalist journalists to create this wild “scientific” scenario of the civilization threatening environmental consequences from Global Warming unless we adhere to their radical agenda.Now their ridiculous manipulated science has been accepted as fact and become a cornerstone issue for CNN, CBS, NBC, the Democratic Political Party, the Governor of California, school teachers and, in many cases, well informed but very gullible environmental conscientious citizens. Only one reporter at ABC has been allowed to counter the Global Warming frenzy with one 15 minutes documentary segment.I do not oppose environmentalism. I do not oppose the political positions of either party.However, Global Warming, i.e. Climate Change, is not about environmentalism or politics. It is not a religion. It is not something you “believe in.” It is science; the science of meteorology. This is my field of life-long expertise.And I am telling you Global Warming is a nonevent, a manufactured crisis and a total scam. I say this knowing you probably won’t believe me, a mere TV weatherman, challenging a Nobel Prize, Academy Award and Emmy Award winning former Vice President of United States. So be it.I suspect you might like to say to me, “John, look the research that supports the case for global warming was done by research scientists; people with PH D’s in Meteorology. They are employed by major universities and important research institutions. Their work has been reviewed by other scientists with PH D’s. They have to know a lot more about it than you do. Come on, John, get with it. The experts say our pollution has created an strong and increasing greenhouse effect and a rapid, out of control global warming is underway that will sky rocket temperatures, destroy agriculture, melt the ice caps, flood the coastlines and end life as we know it. How can you dissent from this crisis? You must be a bit nutty.Allow me, please, to explain how I think this all came about. Our universities have become somewhat isolated from the rest of us. There is a culture and attitudes and values and pressures on campus that are very different. I know this group well. My father and my older brother were both PHD-University types. I was raised in the universityculture. Any person who spends a decade at a university obtaining a PHD in Meteorology and become a research scientist, more likely than not, becomes a part of that single minded culture. They all look askance at the rest of us, certain of their superiority. They respect government and disrespect business, particularly big business. They are environmentalists above all else.And, there is something else. These scientists know that if they do research and results are in no way alarming, their research will gather dust on the shelf and their research careers will languish. But if they do research that sounds alarms, they will become well known and respected and receive scholarly awards and, very importantly, more research dollars will come flooding their way.So when these researchers did climate change studies in the late 90 s they were eager to produce findings that would be important and be widely noticed and trigger more research funding. It was easy for them to manipulatethe data to come up with the results they wanted to make headlines and at the same time drive their environmentalagendas. Then their like minded PHD colleagues reviewed their work and hastened to endorse it without question.There were a few who didn’t fit the mold. They did ask questions and raised objections. They did research with contradictory results. The environmental elitists berated them brushed their studies aside.I have learned since the Ice Age is coming scare in the 1970 s to always be a skeptic about research. In the case of global warming, I didn’t accept media accounts. Instead I read dozens of the scientific papers. I have talked with numerous scientists. I have studied. I have thought about it. I know I am correct when I assure you there is no run away climate change. The impact of humans on climate is not catastrophic. Our planet is not in peril. It is all a scam, the result of bad science.I am not alone in this assessment. There are hundreds of other meteorologists, many of them PH D’s, who are as certain as I am that this global warming frenzy is based on bad science and is not valid.I am incensed by the incredible media glamour, the politically correct silliness and rude dismissal of counter argumentsby the high priest of Global Warming.In time, a decade or two, the outrageous scam will be obvious. As the temperature rises, polar ice cap melting, coastal flooding and super storm pattern all fail to occur as predicted everyone will come to realize we have been duped.The sky is not falling. And, natural cycles and drifts in climate are as much if not more responsible for any climatechanges underway.I strongly believe that the next twenty years are equally as likely to see a cooling trend as they are to see a warming trend.